Both look quite similar from the outside, the main difference being that the Helios has a tube preamplifier while the Orpheus has a more conventional FET preamp. Viewed from the side, you can also see that the Orpheus has a more or less spherical basket while the Helios has a flattened, disc-shaped basket. Both are multi-pattern mics based around a dual-diaphragm, centre-terminated capsule 1.07 inches in diameter. The Orpheus patterns can be switched between omni, cardioid, and figure of eight. By contrast, the Helios pattern control is a knob on the external power supply and allows the pattern to be varied continuously. Perhaps the most unusual aspect of the physical design is that there is an integral standmount, but no provision for fitting a shockmount. That's because the capsule is suspended in a miniature shockmount within the large mesh basket, and because the basket is so large and open (especially in the case of the Orpheus), there should be fewer local reflections to colour the frequency-response curve. The combination of the large basket, the swivel bracket, and the boxed electronics works well with the company logo and the metallic paint to give a very authentic retro, almost Art Deco feel. Unlike on most capacitor mics, the XLR cable comes out of the back of the box rather than out of the bottom (in the Helios this is a multi-pin XLR to link to the PSU) which helps keep it out of the way of the mic stand, though it can foul the swivel if you tilt the mic too much. The Orpheus also has a three-way slide switch to select the pattern, and another one that offers not only a 10dB pad, but also an additional 10dB of gain, which could be useful if your mic preamp isn't all that great. The Helios has no controls at all on the mic body — they're all on the PSU — and it has no added-gain position on its pad switch. As supplied, the mics and their accessories come in good-quality aluminium cases, with the mics themselves in wooden boxes. Mechanically, the standard of engineering is solid without being over-fussy, and the only really sloppy feature I could find was that the mic thread at the bottom of the bracket was rather a loose fit for a conventional thread adaptor until fully tightened. Tighter machining tolerances would fix this, but it didn't cause any problems in normal use provided that the thread adaptor was screwed in as far as possible. The Helios power supply seems to be assembled rather like a giant DI box, with the components fixed to the end panels rather than to the main body, which makes it harder to open for servicing than a conventional PSU. A voltage-selection switch accompanies the IEC mains inlet, so the mic can be used on both 230V and 115V supplies. The mic input and XLR output sockets are on the opposite end, along with a turned-metal pattern-selection knob and two small toggle switches to activate the 10dB pad and low-cut filter. A recessed Tube Ready lamp lights when the system has warmed up sufficiently to be used. The FET Orpheus requires only a standard 48V phantom power source to operate. There is rather less technical spec provided with these mics than I'd like to see for microphones in this price range. Specifically, there's no response plot, so I couldn't see where the presence peak, (which my ears told me was definitely there), was located. Both mics have a quoted 20Hz-20kHz frequency response, but without saying how many decibels down the response is at the extremes, so the numbers are pretty meaningless. Both mics have a 20mV/Pa sensitivity, which is in the same ball park as most other large-diaphragm capacitor mics, and the solid-state Orpheus has a 2dB better EIN figure than the tube-based Helios, which is quoted as 18dBA. While these figures are perfectly acceptable for most studio tasks (and as good as or better than most Chinese-built mics), they aren't as good as some of the newer designs from the more mainstream mic companies. For example, a modern-day Neumann U87 comes in at around 12dB EIN, and many of Rode's mics, which use a new generation of surface-mount circuitry, manage an astonishingly low 7dB EIN or better. The maximum SPL handling is also a little lower than average at 125dB at 1kHz for 0.5 percent distortion. Most mics manage 135dB or thereabouts, with the most tolerant getting up above 140dB. Putting this into perspective, it isn't going to affect vocal recording, and that's mainly where this mic is aimed, but close-miking brass instruments or loud percussion could throw up problems. If you're using this as a conventional studio vocal mic or for instruments like acoustic guitar, then both the noise figure and the maximum SPL handling are absolutely no problem. To check out these mics, I used them on a studio session to record vocals, comparing them with several other mics in my collection. As expected, noise was simply not an issue when close-miking vocals, though the internal shockmounts work quite as effectively as a good external mount — and there's no easy way to fit an external shockmount. As long as you don't actually kick the mic stand while singing, they should get you through with no problem. I did notice some metalwork resonance problems with the mics insomuch as if you tap the metalwork anywhere, you can hear the bodywork ringing. A little more attention to damping, especially in the basket area, would improve this. Both mics turned out to have a generally similar character, but the tube Helios sounded a little more 'rounded' and polished. The sound came over as strong and warm at the low end, though the top end was slightly more pronounced than on any of the mics I used for comparison, and there was a tendency for the mic to emphasise mid-range frequencies in a way that could give some singers a 'barking' or slightly harsh quality when singing hard. If you need more definition in the upper mid-range area, then either of these mics will work well, but you'll need to take care with positioning if you know that the singer suffers from harshness problems. I recorded a female vocal part and in general I was very happy with the sound, though I was constantly aware that when she sang hard the mic was making it rather obvious that she was doing so. The various pattern modes all worked as predicted, with the omni sounding the most open and natural, but at the same time picking up noticeably more of the room ambience. The cardioid pattern has a nice focused sound, while the figure of eight is a useful addition when you want to record with better separation, as you can aim the null towards the sound you're trying to reject. To test the solid-state Orpheus, I recorded an acoustic guitar piece kindly furnished by Gordon Giltrap, who just happened to be working on a project in my studio at the time of the review. The mic's slightly forward character worked well in delivering a detailed, nicely articulate sound, and because the room I was using had a hard floor I found the omni pattern gave the nicest subjective result. There's plenty of low end with both these mics, so the overall impression is of good tonal balance with a generous helping of high-end flattery. 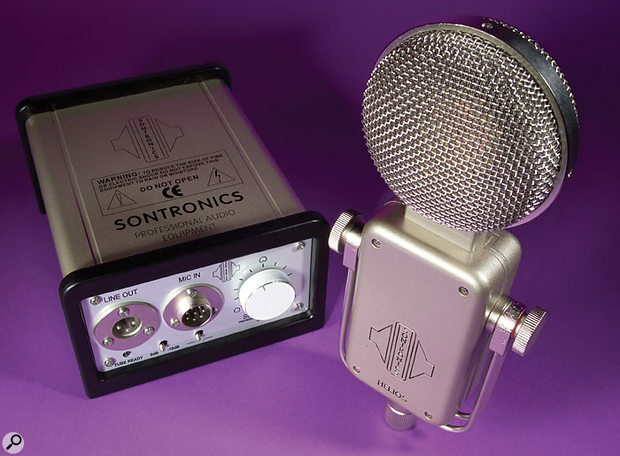 Sontronics have come up with an interesting pair of microphones, and though I (predictably) preferred the sound of the tube model, both can sound good with the right type of vocalist. 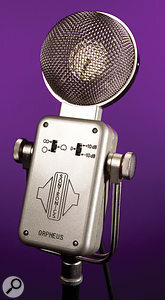 The slightly exaggerated presence peak is good for clarity of diction, making this a very good voice-over microphone, and it also helps focus those with woolly or restrained voices, though it can work against you where the singer already has a strident voice. I love the retro styling, and the idea of integrating the shockmount is intriguing, as is the possibility of switching in 10dB of extra gain in the Orpheus. 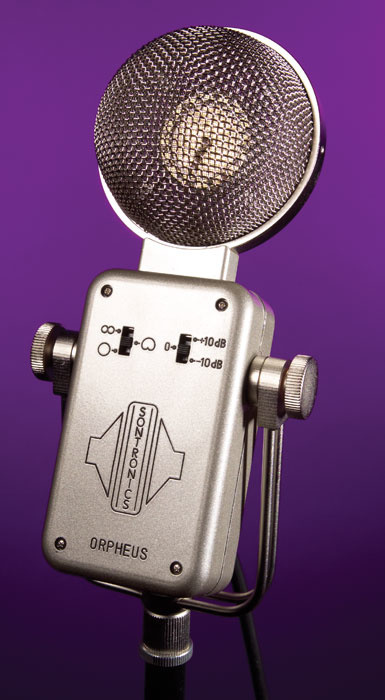 Being ruthlessly honest, I don't think these mics offer anything dramatically different other than their eye-catching styling and a sound which is more 'present' than usual, but on the other hand they are quite affordable and you can make great recordings using them. That extra definition can also really help when working with acoustic guitars or hand percussion. No one mic will ever be right for all singers, which is why most studios build up a collection, but these two Sontronics models have a definite character and might help balance out a mic collection dominated by models that are very warm or overly smooth sounding. May not work so well with singers who have harsh voices. Metalwork could be better damped. It's nice to see mics that look and sound different to their contemporaries. While these mics won't suit all voices, they do have a definite character and can help lift weaker voices out of the mix. Orpheus, £329; Helios, £449. Prices include VAT.